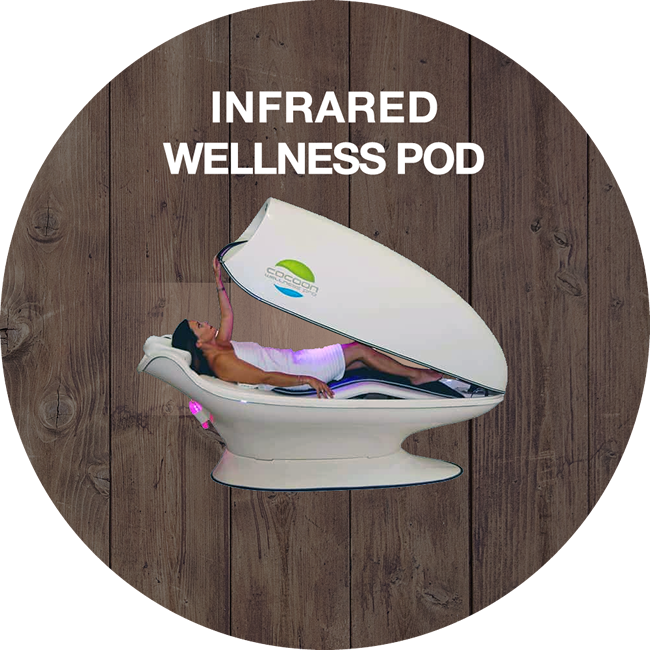 The Cocoon Infrared Wellness Pro offers a myriad of physical and psychological benefits. Great for athletes of all levels, but also wonderful for those who like to relax in encapsulating warmth and soothe sore or tired muscles. The Cocoon Infrared Wellness Pro flushes harmful toxins from the body through a natural process of hydrosis. This leads to the reduction of impurities in the body, helps break up body fat, increases metabolism, and aids in achieving permanent weight loss. It is important to Hydrate well before and after any Infrared or Red Light Session. Most everyone is aware of the benefits that consistent massages have for the mind, body and spirit; although, one incredible massage technique that is often lesser known is the hydrotherapy massage. As you can probably infer, the word hydro implies the use of water and the word therapy implies some kind of healing effect. 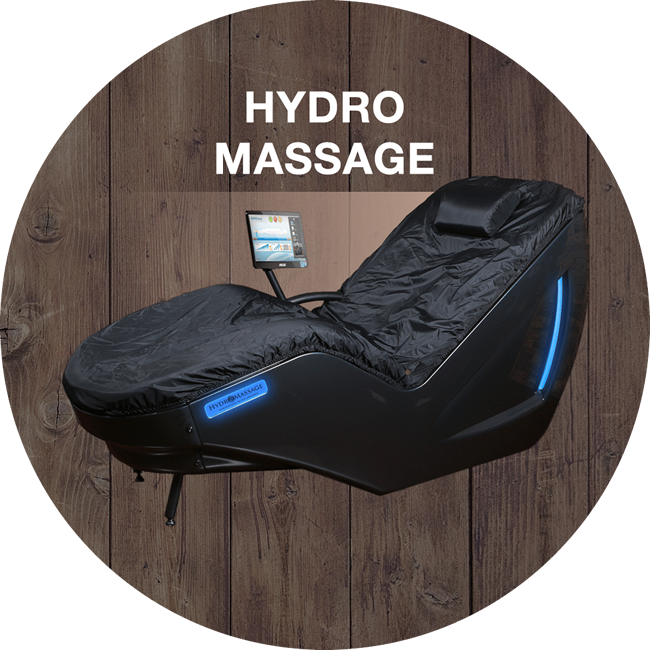 The HydroMassage bed is a convenient, dry, full body massage with the use of pressurized water. Simply lie down in the open design bed, fully clothed, and feel the immediate benefits of the traveling jet system, which delivers an “all sides” body massage. The bed can be easily customized to put pressure exactly where you need it most. 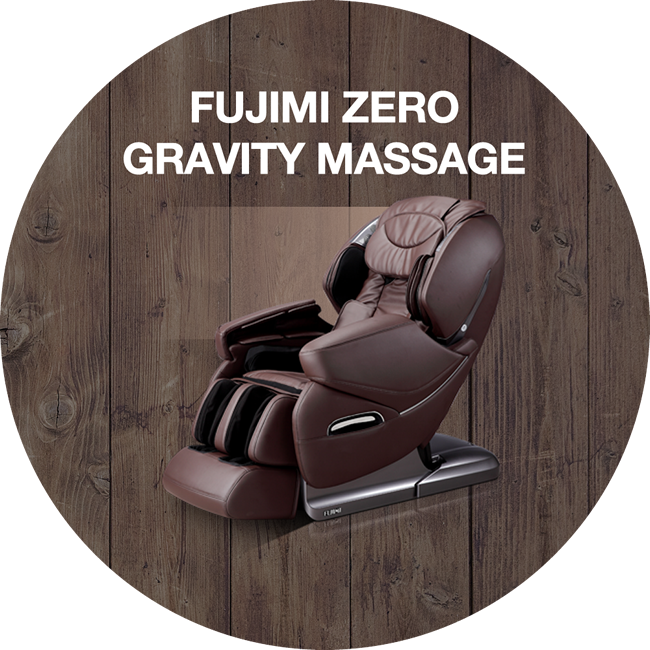 Rejuvenate, Relax, and Escape with our luxurious Fujimi Zero Gravity Full Body and Foot Massage. It’s truly unique! Melt into comfort as the Fujimi massage chair engulfs and pampers sore muscles, gently rubs and stimulates tired feet, and soothes away stress. Find yourself lulled into a sense of total relaxation. Choose from numerous settings to customize your experience to fit your massage needs. Many use massage as part of their healthy-lifestyle regime to help them relax, meditate, and manage anxiety. 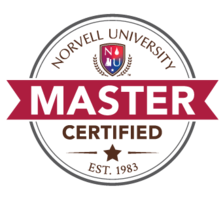 Massage has numerous other benefits including alleviating pain and improving range of motion. Athletes of all levels choose massage to help them relax, prepare their muscles for strenuous workouts, and improve their muscle recovery time after exercising. Enjoy a full body massage or isolate specific muscle groups. Massage also improves tanning results by stimulating blood circulation. Try our incredibly posh Fujimi massage chair and melt into total comfort. The amazing Beauty Angel, the most advanced skin rejuvenation systems of its kind. Beauty Angel – from the innovative folks at Ergoline, makers some of the best tanning beds in the industry – they have devised this system than combines red light therapy and vibrating plate toning to give you the smoothest skin and a youthful appearance that will definitely turn heads! Discover for yourself how Beauty Angel reduces fine lines and wrinkles, reduces cellulite, shrinks pores, and builds healthy collagen, so your skin is left feeling smooth and silky, all the time. Beauty Angel is now available at Body Heat Tanning in Coral Springs. Call ahead today to learn more about the Beauty Angel and how it can take years off your skin! Beauty Angel Red Light Therapy restores your youthful glow. The Beauty Angel is NOT a tanning booth (although it looks like one) and emits no UV Light. It is a Full Body Collagen Stimulator that uses special red lights tuned at 633 nanometers, which are clinically proven to stimulate the fibroblasts (skin cells) to produce collagen, strengthen elastin, and noticeably improve the cellular matrix of your skin. Softer, healthier skin awaits you after a regular regimen of Beauty Angel treatments. As we age, the production of our skin’s collagen and elastin slows down, along with our ability to heal from environmental damage. Beauty Angel helps ‘turn back’ our body’s clock to help our skin get back its youthful luster. All it takes is about three 12 minute sessions per week over the course of the regimen! There is even more to the Beauty Angel than just the Red Light therapy. In fact, the ‘secret ingredient’ lies with the patented professional-grade Vibration Platform that provides a multitude of benefits to you. This includes the strengthening of your core, toning of the muscles (especially the thigh/gluts area), increasing metabolism, and boosting circulation. The increase in circulation dramatically boosts the effectiveness of the Red Light Therapy so it’s actually a double benefit for you! Used initially by Russian Cosmonauts to help prevent the loss of muscle and bone density in space, whole body vibration (WBS) is also utilized in physical therapy and the fitness industries. Many clients of WBS have experienced a reduction of back and joint pain, improved mobility, and an increase in overall flexibility. Click here to find out more! An inter-cellular stimulator with Iso-Slim designed to trigger collagen production while helping to smooth and tone the skin. A powerful face, neck, and chest formula for even more wrinkle fighting power. And a daily enhancer to use after your red light therapy and after shower. This collection is serious skincare that will dramatically enhance the results of the Beauty Angel. Many clients do our ‘Beauty Cocktail’ that includes tanning in your favorite bed followed by the Beauty Angel session. 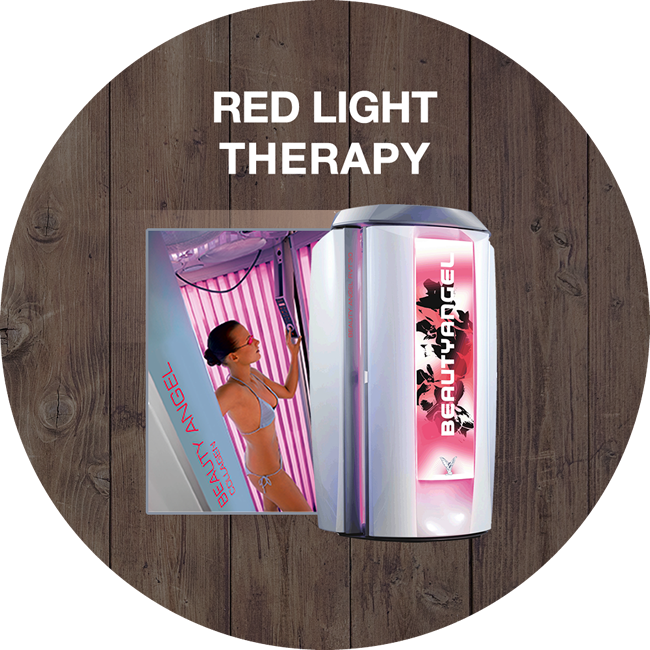 Because of the ‘healing’ effect of the red light, it naturally aids in your skin’s recovery process for an almost ‘guilt-free’ tanning experience! And for clients who do our Spray Tans, we recommend the Beauty Angel before your session as it helps to open up pores and speed up your circulation for a more effective spray tan session! Initially you’ll notice fine lines start to diminish, your skin will have a much smoother feeling to it, pigmentation of the skin will start to even out, and any blemishes or acne will start diminishing. Over time with improved oxygenation and detoxification of the skin is achieved as the vascular walls of the skin’s small blood vessels are strengthened, followed by improved natural repair and creation of healthy skin. This will help restore and firm up tired looking skin, decrease fine lines, wrinkles, and stretch marks, diminish freckles, age spots, eliminate acne, even out pigmentation, minimize the size of facial pores, improve the appearance of sun-weathered skin, and stimulate collagen synthesis. Improving the skin’s underlying supportive structure and making you look and feel years younger. Learn even more about the benefits of this revolutionary skin system, and discover why you should use Beauty Angel, now. Ask us about our in-home skin therapy products designed to augment your results and boost your skin’s healthy glow.